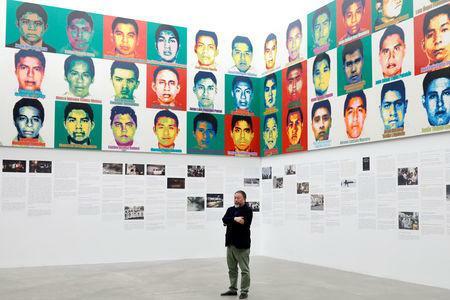 MEXICO CITY (Reuters) - Chinese artist Ai Weiwei unveiled a new installation in Mexico that tells the story of 43 students likely massacred five years ago in a case that exposed government stonewalling and complicity in abuses, a frequent theme for the dissident artist. 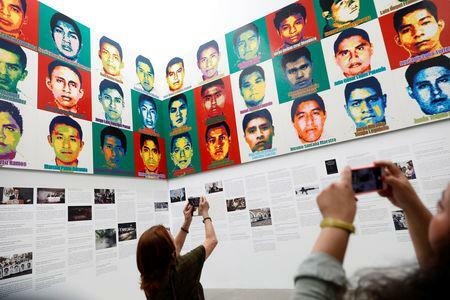 The installation features large portraits of the students made from a million multi-colored Legos that hover above a cavernous exhibit space, images that have become seared into the Mexican conscience by grieving family members who often hoist posters with the same images at protests demanding answers for their sons' disappearance. Entitled "Reestablishing Memories," the work also features a timeline of the 2014 abduction of the trainee-teachers from the all-boys Ayotzinapa Rural Teachers College in southern Mexico and the government's widely disparaged investigation into the case. "Why do we have to do it? Because every crime creates a vacuum and it poisons society," Ai told reporters at a news conference on Thursday. Known for his criticism of Communist-run China's stifling of free expression, Ai said his latest project was partially inspired by the Chinese government's refusal to explain its errors following a massive 2008 earthquake in Sichuan in which thousands of students died in government-built schools. "It reminded me of the Mexicans who lost their children," he said, explaining how his own search for answers following the tragedy was stymied. 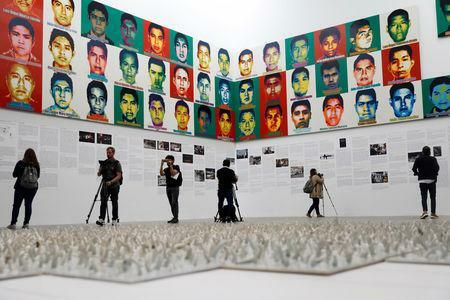 An initial Mexican government investigation found that the Ayotzinapa students were abducted by corrupt police who handed them over to a local drug gang. The gang then killed them for reasons that remain unclear and burnt their bodies in a trash dump, discarding the ashes into a nearby river, it concluded. But the account was tainted by allegations of torture and the possible involvement of soldiers. To date, the remains of just one student have been identified. Ai, who was detained by the Chinese government in 2011 and currently lives in Berlin, supervised the creation of the oversized Lego portraits by students from Mexico's National Autonomous University (UNAM). Last year, Ai accused Lego of refusing to directly sell its interlocking plastic toy bricks to him. The Danish company said its policy was designed to keep it out of politics, but later reversed its stand in the face of a public backlash. "Reestablishing Memories," which is paired with Ai's earlier "Wang Family Ancestral Hall" installation, opens on Saturday on the UNAM campus in Mexico City, and will be on display through October.